Every year about this time I find my self in the throes of Beetle Mania as the Japanese Beetles have converged on my garden. Seems they love all the things I love … roses, plums, flowers, grape vines and on and on. Year after year my plants have turned black as they were covered with thousands of these ugly, plant-eating bugs just munching away. Is this the result of the past two years of drought? Is this the result of a very, very, very rainy spring and early summer? Are you having them in your garden? Fewer than usual? What do you think happened to them? I see what-I-think is evidence of the Japanese beetles in my yard, but we’ve only drowned about 10. I only seem to catch them on my roses. I wish I could catch the ones devouring my vegetables. Sorry to hear that. It may be our last two years of drought that have had the biggest effect. Which means next years we could start the cycle of increase again. Ugh. I heard that Starlings and Purple Martins are developing a taste for Japanese Beetles … that could help us! We have had about an average JB season here in western Carolina. We are having record breaking rainfall. I am pinching as much as possible. When spraying liquid 7, I spot spray only where they are congregating. They tend to find a spot and just keep going to it. I’ve heard drowning them is best as squishing them releases a pheromone that attracts others. Good luck. Hope they leave soon. Maybe the larvae will drown in all the rain! Teresa, even though I’m about to post an article on the awful things I have not seen one here in my NC mountain garden. But I feel qualified to write about them since I had so many bad experiences in MD. One year we hardly had any and we think it was because we had an extremely cold winter the year before and think many of the grubs perished. Yea!! And yes, I miss the REAL Beatles! Not the Japanese Maples. I thought maybe they would be kind to their kin. Bummer. Here in central VA, those Japs have not been a bother in years. In early 2001, the crepe myrtles were covered in them, and I used a Bayer systemic that was very effective, yet all the Japs died in the foliage and stunk to high heaven. Wish there were a raccoon repellent, as one marauder is terrorizing my bird feeders, grapes, and now my one prized persimmon. Last night is scaled the chicken wire fence and ruined all but a few fruits! Time for a condo??? Don’t see you in a condo but that raccoon needs to go. I enjoyed the walk back through time…I have found that being much more aggressive in selecting the right plant for the right spot and selecting shrubs and perennials that support natural predators that my problems with pests has gone way down. This isn’t effective against an infestation, but it is a great long term approach. You are so right on plant selection and companion planting! Thanks for stopping by!! 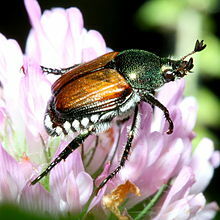 I have seen only one of these beetles in my rosebeds ever. I was a bit shocked to see it actually! It was buried in at the bottom of a bloom smile I was about to photograph. Scampered out of there like lightening when it saw me too! Fell onto the ground and burrowed into the soil quickly. I dug down quickly and tossed the clump of soil into a little bucket where the beetle got positively ID’d and then promptly when on to beetle heaven. Good job Stan!!! We’ve had thousands in the past… I can assure you — you aren’t missing a thing! Ha! I have only seen one! Crazy! I’m not complaining haha. I saw one on the 4th of July and none since. Soooo weird. I know. We have still only seen a couple. FINGERS CROSSED that this is a trend for years to come.